As the historic drought presses on in California – including San Francisco, which recorded zero rainfall in January – state regulators let oil companies inject wastewater into aquifers that held water reserved for drinking and irrigation. 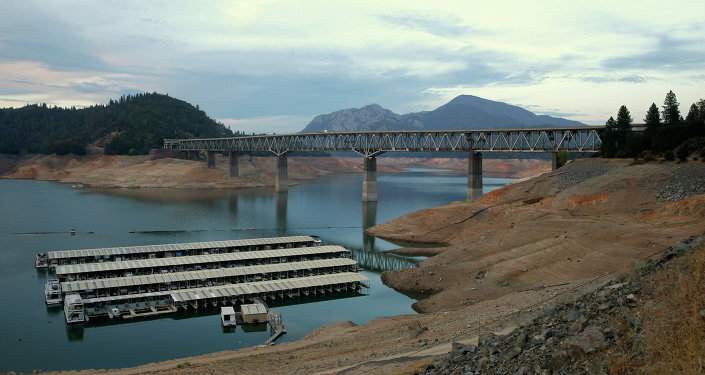 WASHINGTON, February 2nd (Sputnik) — Oil companies in drought-ravaged California are pumping wastewater from their operations into aquifers, potentially contaminating groundwater supplies that have become increasingly important. State regulators permitted companies to drill hundreds of waste-disposal wells into aquifers that store water for drinking or irrigation, the San Francisco Chronicle reported. Companies injected a blend of briny water, hydrocarbons and trace chemicals. Most of the wells are located in the state’s Central Valley, where residents are pumping so much groundwater to cope with the historic drought that the land has started to sink. A dock sits high and dry at the end of a boat ramp yards away from the edge of Folsom Lake near Folsom, California. So far, tests of nearby drinking-water wells show no contamination, state officials said. But the federal Environmental Protection Agency is still threatening to take control of monitoring the waste-injection wells after more than 30 years of state management. The problem dates back to 1983, when the EPA gave state regulators responsibility for enforcing the federal Safe Drinking Water Act. The agreement listed aquifers considered exempt, where oil companies could legally inject leftover water. But there were two signed copies of the agreement, which led to oil companies injecting wastewater into aquifers that were supposed to be off-limits, the Chronicle reported. The EPA first suspected the problem in 2011, and last summer state officials shut down 11 waste-injection wells that they feared could taint groundwater supplies already feeding homes and farms. 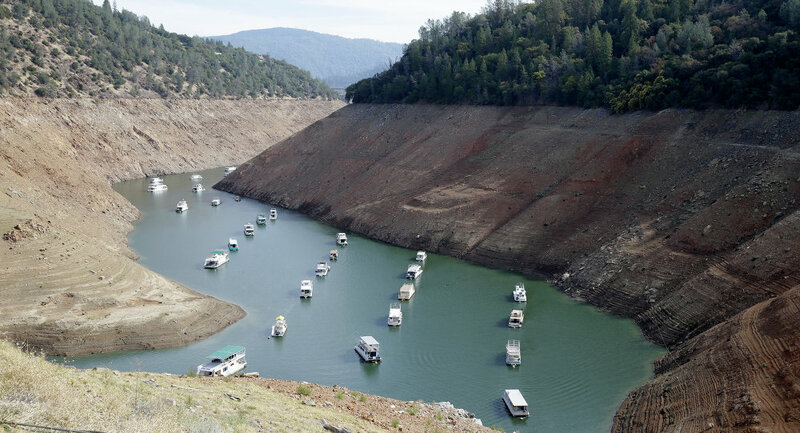 House boats are docked at Lake Shasta's Bay Bridge resort near Redding, California. In 2010, cherry trees on Mike Hopkins San Joaquin Valley orchard starting turning brown, a problem that spread the next year. Tests of the water revealed high levels of salt and boron, both of which can damage trees. Hopkins blames oil companies for tainting the aquifer that used to feed his orchard, and sued four companies that had been injecting wastewater nearby. In another sign of California's persistent drought, downtown San Francisco recorded no measurable rain in January for the first time in 165 years, the National Weather Service said. The agency also said Santa Cruz recorded no rain in January for the first time since 1893. Normal rainfall for that city in January is more than 6 inches. For the Bay Area as a whole, last month was the driest January on record, the weather service said. December brought decent rain to Southern and Northern California, raising hopes for a wet winter, but January turned out to be dry and unusually warm.